The replaceable endura t22 coils have been designed to deliver consistently deep and amazing flavors. T22 tank is made of Stainless Steel and Pyrex glass and is quick & easy to fill and easy to clean. Stainless Steel & Pyrex Glass Tank with matching Delrin mouthpiece. This product does not container any Nicotine or Tobacco. Innokins Endura kit is the ultimate first step for someone looking to move away from cigarettes or for the vaper looking for dependable, long lasting simplicity. The whole kit is designed and optimised to give you a great mouth to lung vape every time. The Endura features a single button design and a consistent output so that you can fill up and vape with no unnecessary fiddling with settings menus and power options. 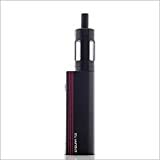 The Endura has a built in 2000mAh battery which when used with the included T22 tank will keep you vaping all day. The device is charged via micro USB and is passthrough capable so is perfectly safe to vape while charging. There are advanced safety measures installed on the unit including overheating and over-discharge protection to improve overall reliability and charging safety. The T22 tank features a 4ml capacity and a stainless steel and Pyrex construction, and is packaged with its 1.5 ohm coil which is optimised for the 14w output of the Endura mod. The tank is designed to deliver a solid, reliable mouth to lung vape and as such does not offer any airflow options. This entry was posted in Organic Health Products and tagged Black, Endura, Innokin, Starter by Organic Health. Bookmark the permalink.